Attorney Travell Travis is a native of Martinsville, Virginia, and a 1996 graduate of Fieldale-Collinsville High School. He received his B.A. in 2000 from the University of Virginia with a double major in History and African American Studies and a minor in Religious Studies. He received his J.D. in 2003 from Howard University School of Law. 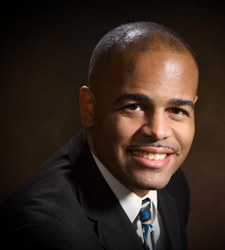 Since 2003, Attorney Travis has been employed by the Hampton University School of Business. Attorney Travis teaches entrepreneurship and business law courses as a faculty member in the Center for Entrepreneurial Studies. In addition, from 2004-2017, Attorney Travis served as an assistant dean for the School of Business. In 2005, Attorney Travis opened the Law Office of Travell Travis, P.L.C. ; a general practice law firm with offices in Richmond and Hampton, Virginia. Attorney Travis is admitted to practice law in Virginia, the District of Columbia and before the Fourth Circuit Court of Appeals. He is a member of the American Bar Association and the Apostolic Law Association. In addition, Attorney Travis serves as the founding pastor of City of Refuge Way of the Cross Church in Richmond, VA. Within the Way of the Cross Church of Christ International, Attorney Travis is a member of the board of bishops and trustee board. Attorney Travis also serves general counsel and as president of its international youth department. Attorney Travis is married to the former Sherina D. Mason of Philadelphia, PA and they reside together in Richmond, Virginia with their two daughters.